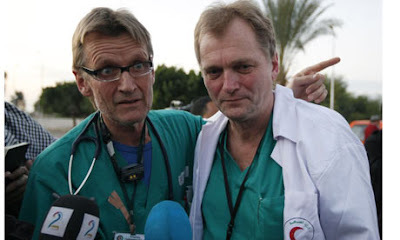 "It was like a scene from Dante's Inferno," recalls Norwegian doctor Mads Gilbert, of the moment casualties started streaming inside Gaza's al-Shifa hospital, after a vegetable market was bombed on 4 January. "I thought: 'This is what hell must look like'. All the screaming, all the pain, all the despair, all the blood, all the torn-off body parts." Gilbert, 61, and his colleague Erik Fosse, 58, recently returned to Oslo after working in Gaza for the first 10 days of the Israeli offensive. As the only western doctors present in the Palestinian territory, they became faces of the conflict, describing the stark reality they were living in to the international media, most of which was barred from access. The doctors were sent to Gaza with the Norwegian Aid Committee (NORWAC), a medical aid agency funded by the Norwegian government, which has worked in the past in southern Lebanon with the Martyr Foundation, an organisation affiliated with the radical movement Hizbullah. NORWAC now works with the Islamic Health Society, which is also affiliated with Hizbullah. But Fosse, who heads NORWAC, explains: "If you want to do medical work [in south Lebanon] you cannot ignore Hizbullah or the Hizbullah-affiliated organisations." Looking gaunt and exhausted, the two medicine professors, who have often worked in conflict zones, said they were surprised that no western journalists were allowed entry into the territory. While he was operating on patients, Gilbert was working in triage, dealing with patients as they arrived. "On the first day (the hospital) had 80 operations. They had 300 patients coming in, and more came in all the time (the next days)," recalled Fosse. "Patients may have been injured far away – if they had not been killed instantly – or individuals would bring in injured people they had found in destroyed buildings." On top of the uninterrupted flow of patients, there would also be a high number of casualties arriving at the same time. "After the attack on the mosque, we got 50 patients in one go," said Fosse. "And after the attack on the vegetable market, we were drowning in patients." Gilbert decided to send a text message to three Norwegian journalists in Israel and a few friends back home. The SMS spread like wildfire in Norway and abroad. It read: "Hell. We wade in death. Blood and amputees. Lots of children. Pregnant women. I have never seen anything so terrible." 50km away from Gaza, Inside al-Arish hospital, a modern slab of stone and glass in the heart of northern Sinai's dusty administrative capital, doctors huddle in an office staring in silence at the latest scenes from Gaza flashing up on al-Jazeera TV. Ahmed Ellabban, professor of surgery at Suez Canal University, shakes his head as he watches the screen. "There are 4,000 injured people just 50km from here," he says quietly. "We're sitting in a very well-equipped hospital with more than 100 doctors on call, ready to deal with more than 400 emergency cases through the week. But they are not coming. We don't know why. We just wait." Al-Arish hospital, the receiving point for wounded Palestinians who make it across the Egyptian border, is a surreal backdrop to Gaza's humanitarian crisis. With the number of patients making it through the Rafah crossing each day rarely reaching double figures, the region's most advanced medical centre sits frozen in tense expectation most of the time, its tiled corridors empty, save for the odd cleaner or official doing the rounds. On some days, no one arrives. But each time a Palestinian ambulance does make it across the no man's land between Gaza and Egypt, the hospital erupts into activity. "Which body part haven't I seen missing?" says one paramedic when asked what type of shrapnel injuries he had witnessed in victims being transported to al-Arish. According to hospital records, one in six of those victims have been children. Outside the ER, her face illuminated by flickering blue ambulance beacons, Nawal Wasa prays for the life of her daughter Hanin, as doctors fight to save her. "She's only 16 years old," Nawal says fiercely. "She wanted to finish high school and go to university. That's all she ever wanted." Nawal's horror began the previous week, when she decided to retrieve Hanin from her brother's house in the Gazan neighbourhood of Zeitoun. "I sent Hanin there to protect her. But that morning, I had a sudden fear of her not being near me, and I knew I had to have her in my arms as soon as possible. Destiny got to her before I could." Israeli jets dropped a single bomb on the house. "He is a teacher; she is a student. We're not Hamas. We don't have anything to do with Hamas," says Nawal. "The rubble tore off my brother's legs and severed Hanin's right foot. By the time I reached the house, people were telling me Hanin was dead." In fact, she was alive, but an endurance test of staggering proportions was awaiting her. Like all those who eventually pull up in al-Arish hospital's car park, her mother had to navigate a bureaucratic maze of Gazan medical officials, the Palestinian embassy in Cairo, Hamas border guards and Egyptian military brass before the go-ahead was given for Hanin to be driven down through the battered Gaza Strip. The journey itself was made on roads torn up by Israeli mortar fire, each bump accentuating the pain of her injury. Ambulances often have to strike out into the desert and crawl through the sand, under constant risk of being bombed by F16 jets; two doctors and 12 ambulance drivers have been killed making just such trips in recent days. "They are murdering the innocent, and those who try and help the innocent. It's criminal behaviour," says Ellabban of the attacks on medics. As Hanin lies, conscious but silent under a mesh of tubes, the hospital lurches yet again from lethargy to frenzy. Relatives spill out on to the steps of the ER as a stretcher is rushed past. The child on the stretcher is eight-year-old Zakaria Ahmed, injured two days earlier when mortars pounded the alleyway he was playing in. Shrapnel embedded itself in Zakaria's legs and skull, but, despite his critical condition, he is one of the lucky ones. "The hospitals at home are overflowing and there's no space for us, so thanks be to God that we reached here," says his father Hamada, a textiles worker in Zeitoun. "Thirty people from my family are already dead. I hope the Israelis one day experience the same nightmares they have brought upon us." "Of course, Israel will always be our enemy," says Nawal Wasa. "Look around you - we are all civilians; we are all victims of our own houses crumbling upon us. I hope somebody gives me some explosives so I can give them what they have given me."